3. for sound configuration, I opened the Volume Control right-clicking on the volume control icon, and I was playing with it. Skype works ok, but cpu usage is very high during a simple voice conversation. 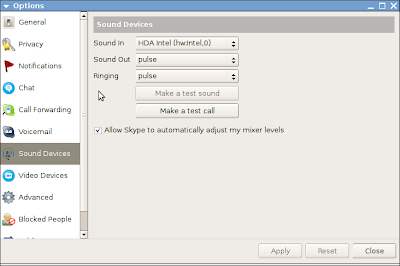 I always use skype with a headphones/mic connected, never with the built-in mic or speaker, so I don't know yet whether or not the integrated mic works ok.